Who doesn’t have scratches on a DVD or CD? Over at Household Hacker I found this video – How to remove scratches from any DVD or CD. This will only remove the scratches not the cracks. You can’t fix the cracks. You know the pulpboard coasters you get from the bar or restaurant. The ones they stick under your drinks? It seems most people take home or have taken home coasters a time or two in their lives, but what do you do once you get them home, they aren’t good for much. 1. Use the coasters as buffers for liquid dribbles in your refrigerator or cabinets. Just put a cardboard coaster down under your condiments and keep the fridge and cabinets clean and free from hard to clean stains. 2. 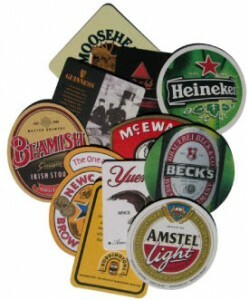 You can reuse them as coasters, just keep a few fun ones on the table for guests to use when they come over. 3. Your kids might enjoy using them as safe-to-throw frisbees. 4. Level a coffee table or small table. Stick a coaster under the leg of a coffee table to keep it level. 5. Fire starter. Use a handful of cardboard coasters to start your fire. 6. Collect them. As fun as collecting matches, people collect cardboard coasters and display them for their friends to see. 7. For decorating cards or scrap books. These cardboard coasters have amazing and fun pictures on them, making them perfect for craft projects. 8. Bookmark. Perfect for marking your place in a book. 9. Use to jot notes down on when no pad of paper is available. You can spruce up your house without spending money simply by using the stuff you already have. Because sometimes, especially in these economically hard days, it pays to reinvent instead of reinvest. Over at Real Simple I found these no money make over ideas. There is no need to buy new stuff when everything you need is already within reach. If you are in the mood to redecorate, try one of these magical-yet-manageable transformations that you can pull off in a pinch. 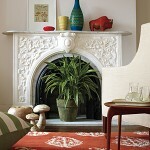 Add a natural touch – Brighten up the black hole by sticking a plant inside the fireplace. Use plants that don’t require a lot of lights, such as a fern. Place a quilt over your headboard – If your bed is boring and you want to add some color, place a quilt over the headboard frame. Place art against the wall – If you were planning on buying large piece of furniture to conceal those ugly cords running along the floor, just use some framed art and set them against the wall to hide those wires. 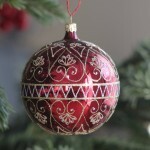 Use bracelets for napkin rings – The bracelets can add a very festive fun touch to your table. Dress up your dresser – Try tying colorful ribbons around the knobs for a splash of color. Left over paint – Use your left over paint to spruce up a chair or small table by painting just the legs. Spruce up your vanity – Use mismatched table ware to store your toiletries in. Grab your seldom used table ware and arrange them on a platter on your vanity to hold your toiletries. These are just a few fun ways to spruce up your home. Go through your closets and start pulling out items you have stashed away and try to use them in new ways. Check out Real Simple for more fun ways to refresh your home.